In spite of having the whole body white and fair but you have the problem of darkness of inner thighs that can be possibly a big embarrassing point for you. Just because of the dark inner thighs, you cannot be able to wear shorts. Most people try to get the results from using the different whitening creams for making the complexion of thighs a kind of fair tone. At last, by finding the negative outcomes, you feel yourself a failure after many tries. It is suggested to you that concentrate on the natural herbs and leaves that can prove to be more beneficial for converting the inner thighs from the dark tone to the lighter tone. Here are 10 useful home remedies which will surely help you to sort out your problem as soon as you constantly do. The advantage of using home remedies is that it will not be harmful to you and will not cause any side-effects. Take three tbsp. of coconut oil. Add the juice of about half lemon (one-third part amount the coconut oil). Massage for about 20 minutes. Massaging action will help in circulating the blood on the darker areas. Now wash off the areas where the face was applied with warm water. This is the amazing remedy of curd and lemon because curd has many benefits for skin and this is a great ingredient which should be applied first. This pack will not only lighters the skin tone but also make it moisturized and supple. Lemon on the other hand, adds the beautiful fragrance on the skin and has acidic and whitening properties that are good for extremely dark inner thighs. You also have an option of adding a little amount of besan or gram flour with turmeric in the pack which will keep you away from the infections. Apply the pack on the dark inner thighs. Sandalwood gives the cooling effect to the inner thighs and soothes the tenderness of the skin. Lemon adds the fragrance and because of having the acidic components, it makes the skin lighter. One of the reasons of dark inner thighs is mocking and rubbing the thighs badly. Vitamin E is rich in almond oil which is essential for the brightening and smoothening of the skin. It also helps in exfoliation and reduces the hyper pigmentation of the areas of the inner thighs. Milk and honey has the moisturizing and anti-bacterial functions. Lemon acts as a bleaching agent. Take three tbsp. of milk; add one tbsp. of honey and the juice of half lemon. Now add a tsp of almond oil in this pack. Apply the pack to the inner areas of thighs and leave it for 20 minutes. Wash it with the water when it completely dries. Oatmeal acts as an exfoliating agent. Curd and lemon act as a bleaching agent. Now apply it on the skin of darker inner thighs. Scrub the areas gently because the skin is very sensitive. Potatoes and tomatoes are great vegetables that help in many skin problems. These both are act as natural bleaching agents and make the skin tone lighter. Honey is used as an antibacterial agent that keeps the skin soft and supple. Apply this paste to whole of the dark inner thighs areas. Apply the pack into your inner thighs and massage with the gentle hands. Aloe vera gel has awesome advantages for the skin but you will wonder how it works as a lightening agent. Apply this paste to the inner darker thighs and allow it to dry. The lemon, glycerin and rose water get together to make a perfect moisturizing and lightening effect. 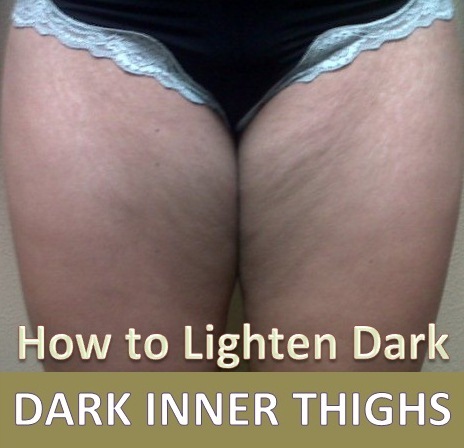 These help in reducing the darker inner thighs areas along with those areas that possess ugly dark spots. This pack not only helps in clearing up the blemishes but also helps to make the skin soft and supple. Apply this pack gently to the inner thighs.